Beistle 60587 Flamingo Boppers. These pretty pink flamingos are a must have accessory to wear to your luau or beach party! 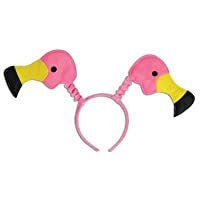 The pink felt flamingos have yellow and black beaks and are attached to a pink felt covered headband. They are one size fits most.